Blinds 800-1600 aggressive kid raises to 4000 from early position and I call from middle position with AK- everyone else folds. After making the call I have 57,000 left. The flop comes 2-2-6 rainbow and my opponent checks to me. I figured to have the best hand here, so I bet 6000. He check-raised me to 14,000, and I called the extra 8,000. The kid had been paying close attention thus far, so I assumed he knew that I could easily play KK or better exactly like that in this spot. The turn was an off suit 7 and again, he bet 17,000 which was a bit more than half my stack. I went into the tank. I just didn't believe him at all and felt like he was capable of trying to move me off a hand like 99 or 10-10 if that's what he thought I had. He'd seen me fold hands in spots where it appeared I had to call, so I was very suspicious. 1) Bet size on the check-raise. If he has AA or KK, then it makes sense, but with me having both an Ace and a King, it makes that less likely. If he had QQ or less, the bet size seems to small. His bet size on the turn felt to me that it meant he was trying to appear as though he was committed to the pot, without actually betting it all. Again, if he has AA or KK here it makes sense, but with smaller pairs I would assume he would make an all-in bet against me. 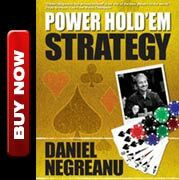 2) We had history and he never laid off of the lead in any of the hands we played, really, so despite my call on the flop which would freeze most players, him following through again on the turn didn't mean what it would seem to mean. In fact, if he had AA there I would expect him to check the turn and hope I bet for him. 3) What put me over the edge was when I looked over at him. I saw something (not going to say what) and as soon as I saw that I said, "All in." He only had to call another 16,100, but decided to fold. I'm not sure what he had, but it felt like a total bluff to me. However, it is possible that he had a hand like 33, and decided to fold thinking he only had two outs. It was a key pot for me, and the only really tough spot I've found myself in during the tournament. I seriously have just been playing small ball to a tee, and it honestly even surprises me sometimes how well it works. Now that we are down to the nitty gritty, I hope that tomorrow my focus is better and I can start to really pay attention to my opponents. Up until this point, I've spent very little time worrying about what they are doing, and instead solely focusing on what I'm doing. I ended the day with 92,600 and there are 73 players remaining. 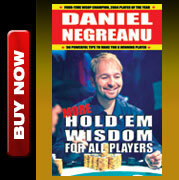 You can follow me, as always on twitter.com/RealKidPoker.